As a professional WordPress blogger, you start afresh. As the time and experience increase, feature demand is increased too. This costs adding new scripts to your site and makes your site heavy… and heavier. After a certain time you realize that you have made your site a garbage bin by unordered input of scripts and plugins. If you are at a fast loading CDN service or host, number of script files won’t bother you. But if you are using a comparatively slow web-host (like GoDaddy! ), then you surely need a great caching plugin. wow that took a good minute to load. lol. There was no lazy-load plugin. I decided to deactivate the W3 Total Cache plugin and switched to the premium caching tool : WP Rocket. WP Rocket is a great and very affordable WordPress caching and speed optimization plugin by a visionary developer team from France. 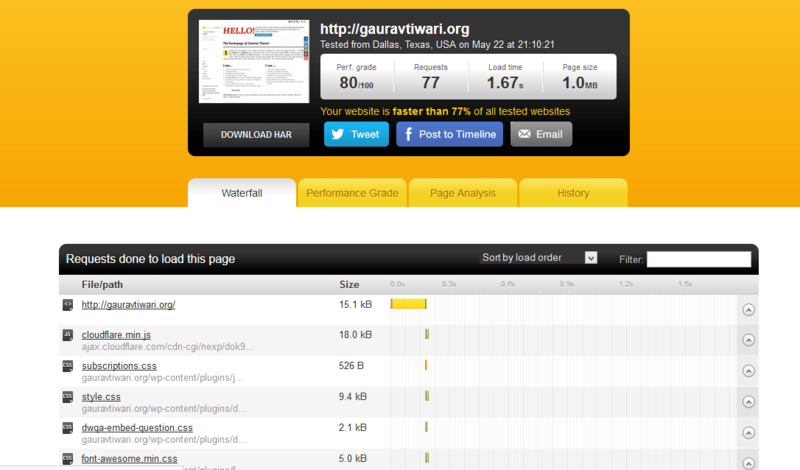 WP Rocket is a caching and website performance improvement plugin for WordPress hosted sites. It works in almost the same way other plugins do : ‘Download’ the plugin files, upload to your WordPress installation’s plugin directly and activate it. 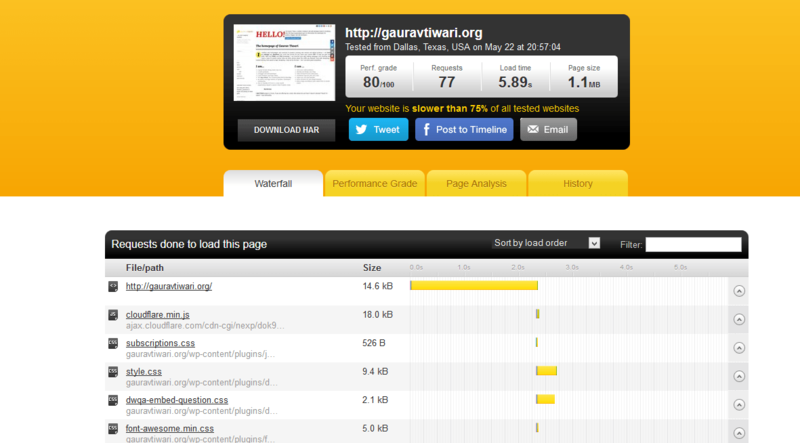 The configuration was found to be the easiest of all other plugins available and it took just four or five minutes for me to properly configure it for gauravtiwari.org. Simple interface. Not too many options. Easy to set-up. No coding required. Image lazyloading at its best. Works with any theme you use and highly reduces the number of HTTP requests for heavy sites. Mobile Caching : Enables caching for high-end smartphones. Stores website’s static files for better and faster reloading of the pages. More details about the features are available as a comparison table at WP Rocket Features page. It is said, “first impression is the last impression” and WP Rocket really made the one on me. I have been using WP Rocket for last two months and my site has suffered no issues at all. Now I am using DIVI 2.0 WordPress theme from Elegant Themes, which is both feature and script heavy. But thanks to WP Rocket, blog articles load as quick they should, codes are not broken and theme design is not compromised by even a single pixel — what else do I need? Top notch plugin, for sure. WP Rocket is suggested to all WordPress bloggers, who can spend a few bucks for the sake of speed and optimization. 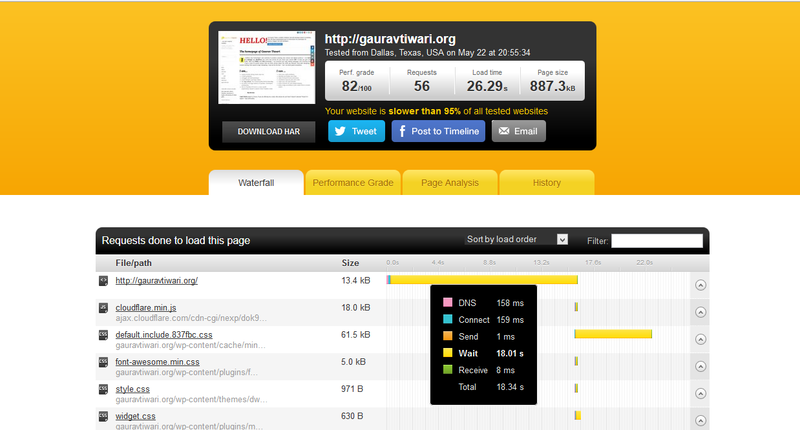 It is highly recommended for heavy sites with average/slow web hosts. WP Rocket is priced at USD 39 for one and USD 99 for three WordPress installations . It can be purchased from WP Rocket’s Pricing page. PS: While buying you may see a few French phrases on their site on time by time. Tiny human mistakes and probably this is how multilingual sites (mis)behave. WP Rocket plugin itself has great video tutorials on TUTORIALS tab inside the plugin configuration page. Frequently Asked Questions (FAQs) are answered in another tab FAQ. If you are seeking for further custom support, you can use WP Rocket Support Forum.